I was doing some Christmas shopping last night so I happened to drop into Bath and Body Works of course! I promised myself this year I would NOT get sucked into the evil lure of Bath and Body Works simply because I was feeling quite cheap! Yes, I said cheap. I know cheap and the Muse are something that don’t go well together but indeed I was being cheap and if you may I was also being…frugal! So why was I being cheap and frugal? Bath and Body Works has the biggest array of awesome Holiday gifts and they are all so pretty and sweet and I want everything (for myself) however the evil lure of all these goodies did not even phase me! I didn’t even blink a little eyelash upon viewing all those wonderful, bright packages and colorful shower gels! Are you screaming blasphemy yet?! When it comes to gift giving for friends and family I truly have no problem shelling out cash however I would not be tempted by all this wonderful bath candy last night simply because the past few years I’ve given into the temptation to buy tons and tons of Bath and Body Works all to have it be given away practically for FREE on Boxing Day and the entire week after Christmas! I’m talking major deals! $6, $5, $4, even a $1! Items are normally price tagged at $12 and upwards! being reduced to $4 and $3 totally makes me fall on the floor and convulse in anger that I paid the original price tag for these things! MY GOD It’s a CRIME! I boycotted Bath and Body Works and told myself I’d not spend a dime for anyone in that shop simply to avoid the drama of tears and anger (ok maybe not tears but I love the drama don’t you?) later when it was all reduced and placed on clearance. A few items that most definately tempted me to spend, spend, spend was of course all the new Temptation 3 in 1’s! I adore Twisted Peppermint and really wanted to stock up but I was being a smart shopper (pat, pat on the back for this Muse) knowing that these $12 bottles would be $6-$4 after the Holiday was over! However, the force and lure of Bath and Body Works is strong and I did spot a sign that simply red 50% off in big red letters. I could feel my heart pounding out of my chest at this point so I slowly went over to investigate (my best mate Jen was with me at time and she can vouch that I was literally tiptoeing over to see what the sign was all about! She calls me the “passionate shopper” and says I should have my own show amply named that)! And to my utter delight it was Sassy Strawberry that was on sale! That meant it was $6! I was nabbing a real steal here! I had to have it immediately at this price! So I snatched up two bottles (one for me and one for my sister who loves the Temptation line as well)! I made sure to be quick because there was about 5000 bottles there and god knows at any second a big crowd might wander in and grab them all before I got my chance to get a bottle for my very self (drama kids drama). I mistakenly didn’t bother smelling Sassy Strawberry before purchasing it. I have this system where I avoid smelling things because I know I’ll want them. So when I stopped into the shop last night I encouraged myself NOT to smell any of the Temptations because I’d definately want them as soon as my nose tickled with the aroma of Mint Chocolate, Peppermint, and Gumdrops! 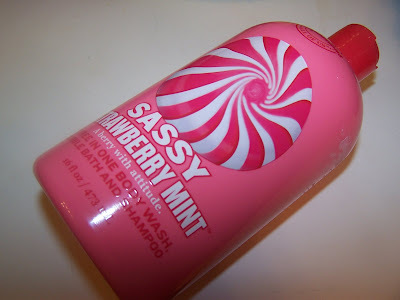 When I seen Sassy Strawberry on sale I just assumed that Strawberry and Mint would be a lovely marriage so I didn’t smell it prior to buying. You know cheap shampoo? Suave Strawberry Shampoo, V05 Strawberry Shampoo, and hell if you’re as old as me dare I say White Rain Strawberry Shampoo. That’s what this smells like. Really, really cheap shampoo. I can’t believe it. To be honest when I originally read about this on the site I literally we’ed myself in excitement at the thought of Strawberries mixed with delightful mint! I thought for sure this would take over my love affair with Twisted Peppermint and make it onto my “must have at all costs” list! However, I don’t get any mint I simply get a very plastic, fake Strawberry smell. I’ve never met a bottle of Temptation 3 in 1 that I didn’t love but this would make it on my “do not want”, “do not love” list. Sorry Bath and Body you missed the boat on this one. Who in the world thought this was a good idea? I’m just wondering where the mint went?!?!?! I convinced myself that my batch must have went off so I opened my sister’s bottle to smell and again just a strange plastic strawberry smell. I’m so disappointed I may just spit or cry (or neither but it sure sounded good!). I’m really somewhat shocked as I’ve truly had great experiences with the line up until this catastrophe! I’ve even went so far as to say the line was better than Philosophy. 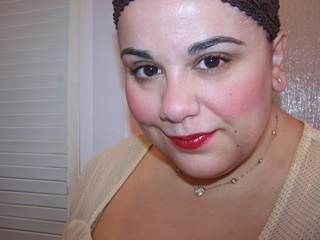 The Muse says avoid the Sassy Strawberry and spend your hard earned $6 bucks on something else! I’m going to go meditate to make myself stronger against the lure of Bath and Body Works! Don’t give in people! It’ll be on sale before you know it! Be strong! Tell me! Your Muse is curious what you thought about Sassy Strawberry! Muse, you once again had me in hysterics with this post. I don’t know if you mean to be funny or not, and it’s certainly not hilarious that your shower gel smells icky, but it’s just the way you put things. Did you smell the Gumdrop yet? I took it back because it smelled like that fake-bubble gum penicillin I used to take as a kid for bronchitis or ear infections. Blech! Well thanks for telling me gumdrop is officially off my list now lol! LOL! Happy Shopping 🙂 and TELL ME WHAT YOU GET!!!!!!!!!! Muse, I finally did it last night! I just did my best and placed an order with JPMon! I emailed them to see if it went through and I haven’t gotten a reply, but did get some sort of email in Chinese that looks like a confirmation with EMS shipping #. The first time I did it something went wrong – the c/c info wasn’t asked for and it gave me some strange message. The second time it did go through apparently and looked exactly like your tutorial screenshots. WAHOOO! I’m so chuffed! That’s fab! I can’t wait for your goodies to arrive! I’m positive it went through fine if you got your confirmation! You should get another one shortly with tracking! They ship FAST! I’m so happy you nabbed it! Good on you! Can’t wait for you to get your goodies! And I think there were a couple of eyeliners, a brow pencil and something else thrown in there. I started off small – if this works out OK, then I’ll place a larger order! LOL Taryn nice damage 😉 Good haul! Got a link for the fairy drops mascara?! I love the Sony CP lip and hand creams! So yums! The Tiffa shadow is great!!!!!!!!!!!! how was the shipping costs? Did they reply back to you yet?! Enjoy your goodies! Can’t wait to hear all about them!